Is IBM following the right strategy? Is IBM a globally integrated enterprise focused on worldwide collaboration or is it an organization which is rotten to the core? Do you think that Samuel Palmisano (IBM CEO who retired last year) built IBM into the world’s leading information technology company or has he destroyed almost every one of his predecessor’s real accomplishments? It depends on who you listen to. (1) Is IBM a globally integrated enterprise focused on worldwide collaboration? Bill George is professor of management practice at Harvard Business School seems to think so. If you look at the numbers then this view is justified as in 5 years IBM’s earning-per-share under US$ 5 to around US$ 13. (2) Is IBM, rotten to the core? That is the view is expressed by Robert X. Cringely in his 6 part blog post about what is wrong with IBM. “My opinion is that IBM’s services business profit will continue to decline as they try to cost cut into prosperity. Unless they find a way to grow revenue and provide a quality product (service), they’re either headed for a sell-off of the entire service business, probably to some Indian partner, or to a complete implosion. In short, it’s a race to the bottom and IBM is winning.” – Watch out IBM! Why is Mr. Cringely so unhappy with IBM? …the language barrier for IBM’s Indian staff is huge. Troubleshooting, which was once performed on conference calls, is now done with instant messaging because the teams speak so poorly. …the problems that an experienced person could fix in a few minutes are taking an army of folks an hour to fix. This is infuriating and alarming to IBM’s customers. …the offshore teams often lack the skill and experience to do the work, problems mount, customers … get upset and leave. Are these acquisitions based on hard facts or are they based on one of anecdotal experience? If unhappy customers are leaving IBM then how come there is no decline in revenue? Over the last 5 years (except for 2010) IBM revenue has shown a year-on-year growth. Profitability has improved. Earning-per-share has more than doubled. Is all this possible when customers are leaving IBM? Also, it would take extraordinary inept management not to notice such customer dissatisfaction for 5 years. Also, could IBM have competed with the Indian IT service providers (TCS, Infosys, Wipro etc.) without having offshore center in India? Has IBM employed 150,000 unskilled people in India? IBM has around 150,000 people in India which is about one third of its total strength. This ramp up has happened in last 10 years. IBM is probably the second largest private sector employer in India. Do any of these alternatives look plausible? Which is the growth market for IBM? The growth market for IBM is India, China, Latin America, West Asia and Africa. According to Business standard, in 2011 this market accounted for 22% of IBM total revenue and grew 16% year-on-year. BRIC countries (Brazil, Russia, India, and China) grew at 19% Y-o-Y. Same trend continues in first quarter 2012. Could IBM have addressed these growth market without India and other local operations? 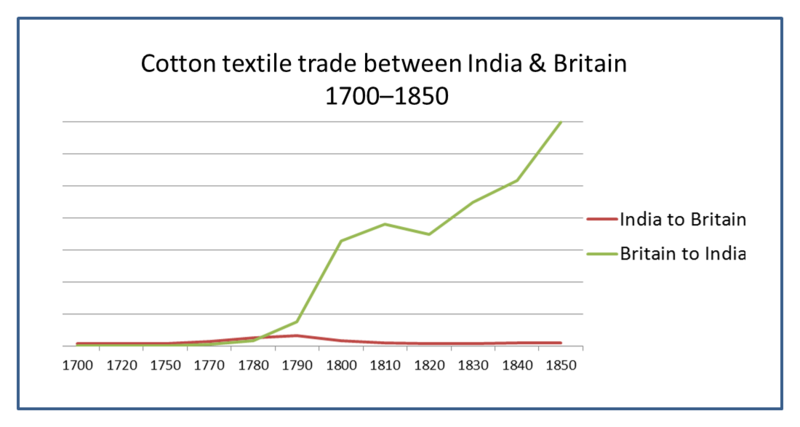 In 1700, India was the world’s main producer of cotton textiles, with a substantial export trade. Indian textiles were exported to Britain on a large scale from the seventeenth century. By the early nineteenth century, however, Britain had become the world’s most important cotton textile producer, dominating world export markets, and even exporting to India. Tata Motors bought Jaguar-Land Rover for US$2.5 billion in June 2008 from Ford Motor Co. which Ford had acquired separately (Jaguar and Land Rover) for a total of US$5.3 billion. The acquisition coincided with the global financial crisis that plunged Jaguar Land Rover’s sales and put a huge strain on Tata Motors. In the 10 months post-acquisition, sales volumes plunged 32%. To staunch the hemorrhage at the British unit, Tata’s management focused on reducing costs, improving efficiencies and managing cash flow. When the market turned, the premier car maker was well poised to reap the benefits and turned profitable during the quarter ended Dec. 31, 2009. So, how is IBM doing? When the market dynamics change, when the industry cost structure change you have to be bold and adjust your strategy to suit the new reality.